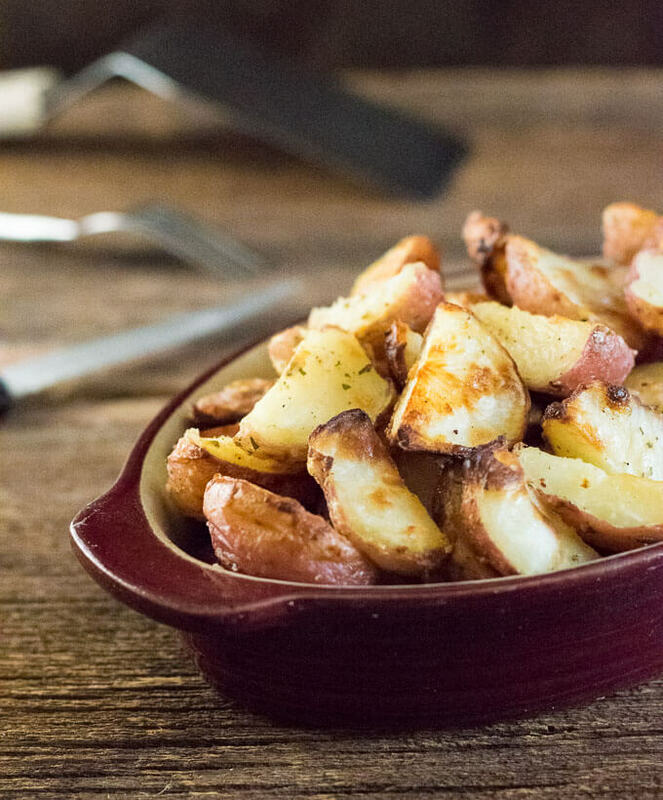 Roasted Garlic Ranch Potatoes will soon be your family’s favorite side dish. Liberally dusted with garlic and ranch, these red potatoes are tantalizingly crisp on the exterior and mouthwateringly creamy inside! Sometimes you just want to hit life’s easy button. However, if you learned one thing from grandma it is that nothing worth having comes easy. Well, I hate to break it to you, but grandma was a masochist. After all, who would willingly defy physics to walk uphill to school each way? I hate to call grandma a liar, but these Garlic Ranch Potatoes are certainly worth having and they are easy to make! This Garlic Ranch Potatoes recipe is one of those super easy recipes I almost didn’t publish on my blog because I thought, “Well, any idiot can dump ranch seasoning on potatoes.” Though that may be true, this recipe tastes so freaking good I felt it was worth highlighting. I also think it tastes better with garlic added to the mix, and rather simply roasting the potatoes, I am showing you a trick to make the potatoes extra crispy. You’ll notice most recipes for roasted potatoes simply call for you to stick them in the oven. If you do that, you are missing out on the key to perfect potatoes! What you want to do is par-boil them first. This makes the exterior more tender so you can scuff them up by tossing them in a colander. The scuffed bits crisp and char during baking, yielding the best-tasting potatoes you’ve ever sunk your teeth into! Yeah, it isn’t as easy as simply roasting your potatoes in the oven, but nothing worth having comes easy. My grandma taught me that. This article contains affiliate links. 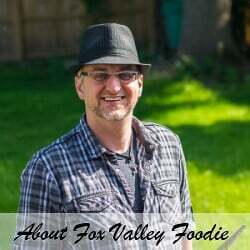 Any Amazon purchases made through this link helps support FoxValleyFoodie.com at no additional cost to you. 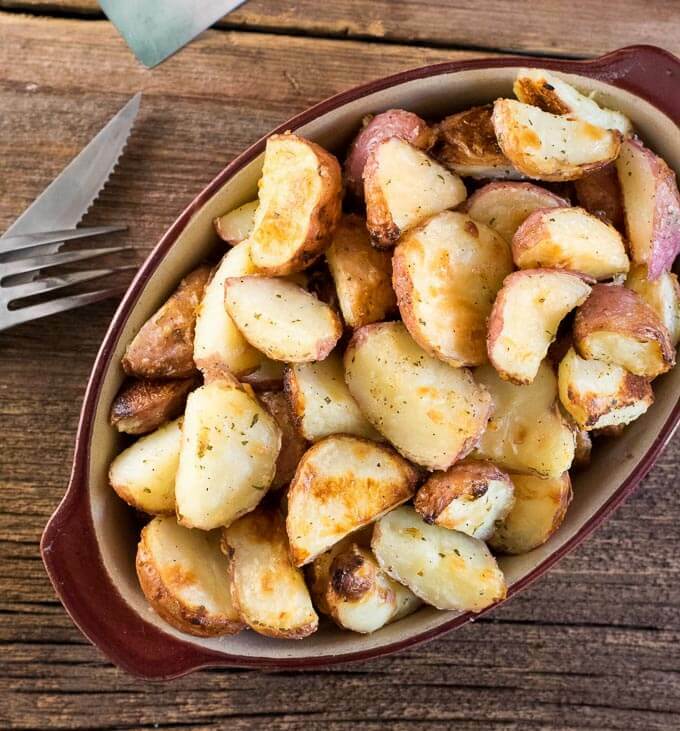 Roasted Garlic Ranch Potatoes will soon be your family's favorite side dish. Liberally dusted with garlic and ranch, these red potatoes are tantalizingly crisp on the exterior and mouthwateringly creamy inside! Bring a large pot of water to a boil and preheat the oven to 450 degrees. Drain potatoes from water and add toss briefly in a colander to scuff the exterior of the potatoes (this will create crispier roasted potatoes). Add potatoes to a large bowl along with oil, ranch, and garlic. Toss to combine. 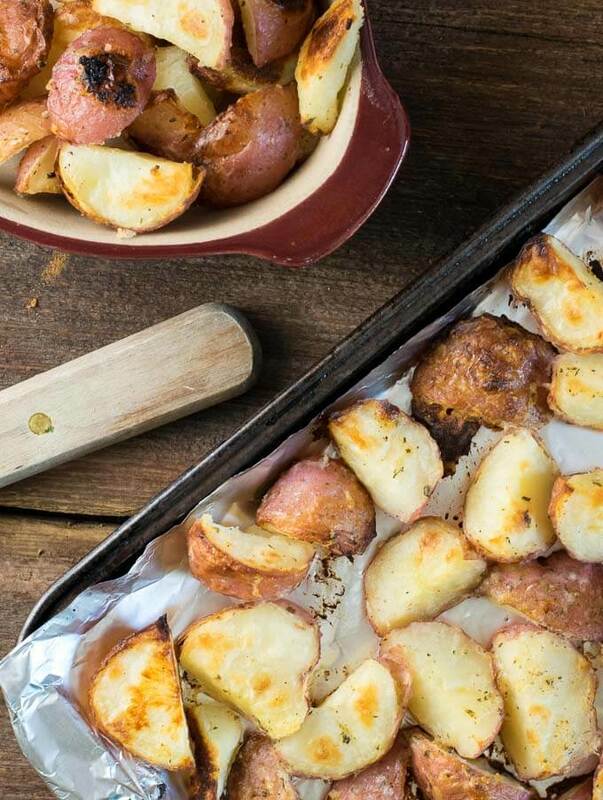 Place potatoes on baking sheet and roast in the oven for 30 minutes, or until crispy, turning once. 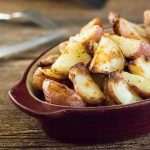 If you liked this recipe be sure to check out my Secret to Perfect Crispy Roasted Potatoes to learn more about getting awesome roasted potatoes every time! If you enjoyed reading my Garlic Ranch Potatoes recipe then you should probably like me on Facebook and follow me on Pinterest too. That’s what I would do at least, because if you don’t get to know me but you still use my recipe it is kind of like taking candy from a stranger, and your mom taught you not to do that. Don’t disobey your mom, subscribe to Fox Valley Foodie today. We LUV roasted taters and veges even cold so I suggest doubling the recipe. We also LUV those cute little fingerlings and small round guys!! Living in the deep south a big toaster oven is a must, the big oven makes the kitchen SO hot, they’re definitely worth the investment. Doubling the recipe is a great idea. I made myself another batch with lunch today I’ve eaten most of it myself! Great tip on roughing up the sides to make them crispier! Love oven roasted potatoes!